15th and early 17th centuries in different regions of Europe, in which there was a conscious revival and development of certain elements of Classical Greek and Roman thought and material culture. 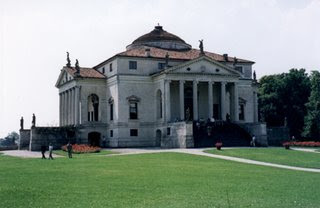 The Renaissance style places emphasis on symmetry, proportion, geometry and the regularity of parts as they are demonstrated in the architectu re of Classical antiquity and in particular, the architecture of Ancient Rome, of which many examples remained. 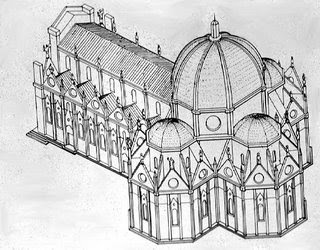 Orderly arrangements of columns, pilasters and lintels, as well as the use of semicircular arches, hemispherical domes, niches and aedicules replaced the more complex proportional systems and irregular profiles of medieval buildings. Plan: The plans of Renaissance buildings have a square, symmetrical appearance in which proportions are usually based on a module. Within a church the module is often the width of an aisle. 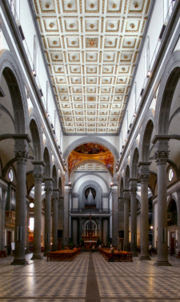 Central plans are commonly used, combined with basilical models, and frequently buildings are a combination of both. 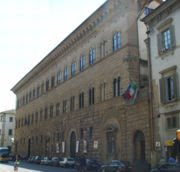 Façades: Façades are symmetrical around their vertical axis. 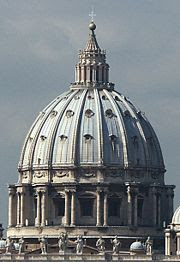 Church facades are generally surmounted by a pediment and organized by a system of pilasters, arches and entablatures. The columns and windows show a progression towards the centre. Domestic buildings are often surmounted by a cornice. There is a regular repetition of openings on each floor, and the centrally placed door is marked by a feature such as a balcony, or rusticated surround. Columns and pilasters: The Roman orders of columns are used:- Tuscan, Doric, Ionic, Corinthian and Composite. The orders can either be structural, supporting an arcade or a rchitrave, or purely decorative, set against a wall in the form of pilasters. Arches: Arches are semi-circular or (in the Mannerist style) segmental. Arches are often used in arcades, supported on piers or columns with capitals. There may be a section of entablature between the capital and the springing of the arch. Vaults: Vaults do not have ribs. They are semi-circular or segmental and on a square plan, unlike the Gothic vault which is frequently rectangular. The barrel vault, is returned. Domes: The dome is used frequently, both as a very large structural feature that is visible from the exterior, and also as a means of roofing smaller spaces where they are only visible internally. Ceilings: Roofs are fitted with flat or coffered ceilings. They are not left open as in Medieval architecture. They are frequently painted or decorated. Doors: Door usually have square lintels. They may be set within an arch or surmounted by a triangular or segmental pediment. Openings that do not have doors are usually arched and frequently have a large or decorative keystone. Windows: Windows may be paired and set within a semi-circular arch. They may have square lintels and triangular or segmental pediments, which are often used alternately. Windows are used to bring light into the building and in domestic architecture, to give views. Stained glass, although sometimes present, is not a feature. Walls: External walls are generally of highly-finished ashlar masonry, laid in straight courses. The corners of buildings are often emphasised by rusticated “quoins”. Basements and ground floors were often rusticated. Internal walls are smoothly plastered and surfaced with white-chalk paint. For more formal spaces, internal surfaces are decorated with frescoes. As it is a more profane art religious buildings are not exclusive. Churches: Continue being one of the most important buildings. They tend to be of central plan and they are full of classical elements. · Palaces are urban buildings. They tend to be three-storey and they are very closed, with walls treated in different ways depending on the floor. They are symmetric and have several windows. 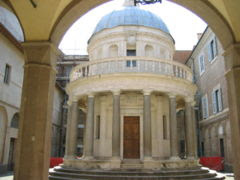 Internally they are organised around a courtyard and they have a loggia. · Villas: They are in the countryside. They loose their defensive character to become just a place for living in contact with Nature. They consist of a central cube standing on a strong base and they are surrounded by gardens.